It's new releases week, so today we are going to look at Terra Australis, a new limited quantity Shake 'N' Shimmy ink from Robert Oster. Only 100 50ml bottles were made, and each comes with a letter of authenticity signed by Robert Oster. I purchased my bottle of ink from Pen Chalet, the only retailer in the US to carry it right now. 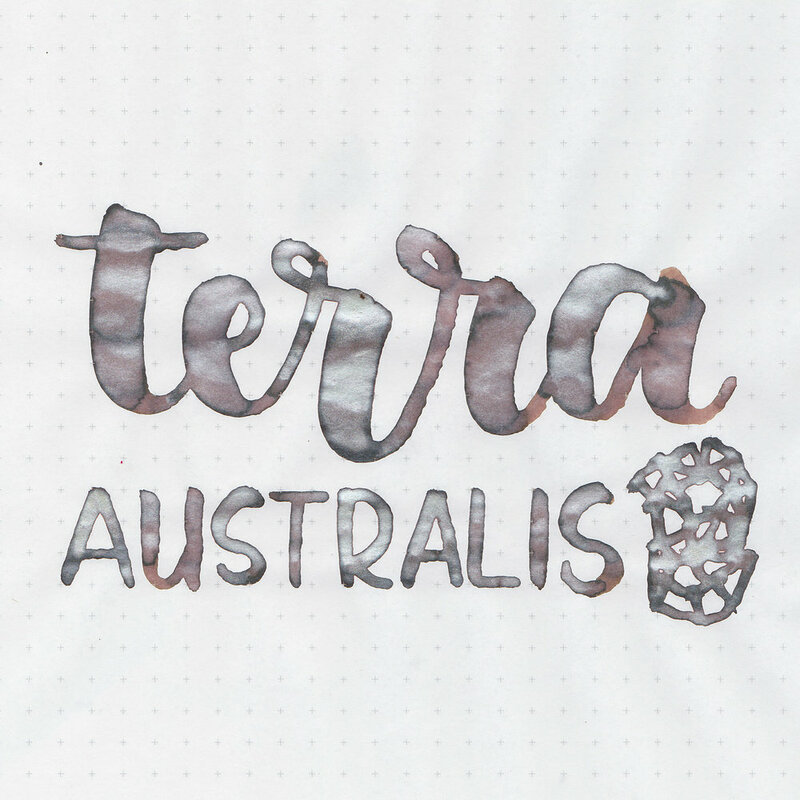 Terra Australis is a dark brown with lots of shimmer. There is a ton of shimmer packed into the ink. Other properties: Low shading, no sheen, and tons of shimmer. On 20 pound copy paper the ink behaved really well, just a little bit of bleeding in the large swab. 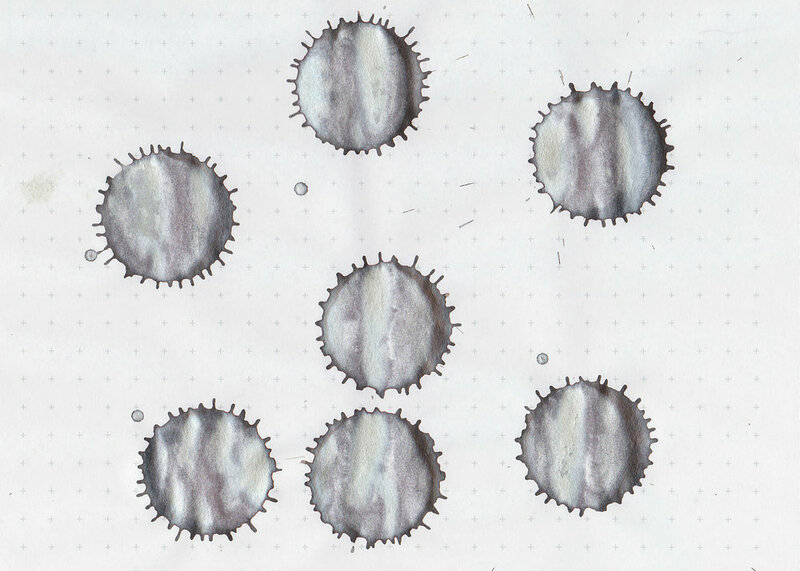 Ink swabs for comparison, left to right (top to bottom for mobile RSS): J. Herbin 1670 Caroube de Chypre, Robert Oster Terra Australis, and Pelikan Edelstein Smoky Quartz. Click here to see the Robert Oster inks together, Shake 'N' Shimmy inks are at the bottom of the page. Robert Oster Golden Brown, Montegrappa Coffee Brown, and Robert Oster Melon Tea. Click here to see the brown inks together. Of these inks, I think Golden Brown is the closest non-shimmer ink to Terra Australis. I used a medium Edison Nouveau Premier Seaglass on Tomoe River paper. The ink had an average flow, but I was having a hard time keeping the shimmer consistent. 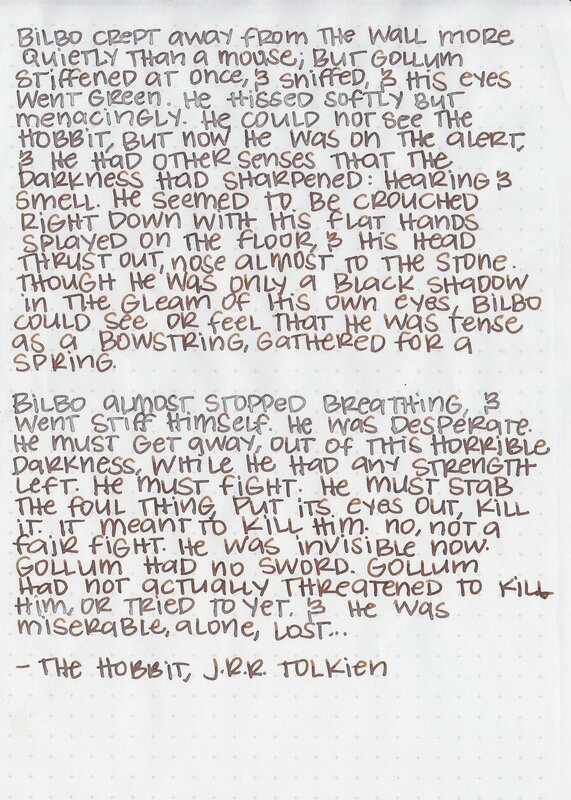 The first sentence had good shimmer, then it would decrease for a few lines until I rotated the pen. Overall, it's a nice ink. I think in the future I would only really use it in a flex nib. The shimmer is just too hard to keep consistent in the smaller nibs. Give it a try, you might love it.